In today’s modern age, finding the lighting controls you need to create the perfect ambience in your home or business property is simple. The dimmer has long been called upon to ensure a relaxed and inviting atmosphere can be felt by all and these days high quality modules make it easier to unlock the multiple benefits associated with this lighting control option. Dimmer modules deliver a number of advantages; as well as offering flexibility from room to room, you can also save energy and money thanks to the option of reduced wattage. Here at Bulbs and More, we stock a wide range of dimmer modules, including standard, LED and intelligent LED. Our standard dimmer module allows you to adjust wattage from 40 to 400W, whilst our LED compatible module gives you the option of adjusting lighting from 100W to just 3W. Our sophisticated programmable control system courtesy of the intelligent LED dimmer module goes one step further. New to our range, this dimmer module may be more expensive than manual dimmers and switches but offers excellent flexibility. To find out more about our dimmer module range, please browse the products below or call our Walsall based team direct on 01922 619 730. 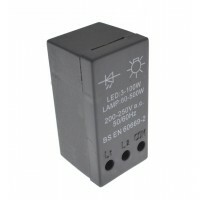 Intelligent LED Dimmer ModuleLED: 5-100WLamp: 40-250WTrailing EdgeBS EN 60669-2&..